When Juan showed up for work one morning at Siam Terrace on Main Street in downtown Urbana, two men were waiting for him in the parking lot. They were dressed in plainclothes, but wearing guns on their hips. They asked him his name and put him in handcuffs. Juan had lived in Urbana for eight years, but this was to be his last day. He was picked up by two agents from Immigration and Customs Enforcement (ICE) and sent to a remote jail in Southern Illinois to await deportation proceedings. A year ago, Urbana proclaimed itself a sanctuary city, but ICE agents are coming through town to sweep up local immigrants without challenge. We often hear in the news about ICE raids in big cities, or along the border. But in Midwestern towns like Champaign-Urbana, ICE is expanding its presence, a sign that the war on immigrants is intensifying under President Trump. Indeed, in 2017, arrests of undocumented people went up by 30 percent. According to obtained documents, last year ICE visited Champaign County on 28 different days, on some days going to several residences. Since mid-2015, I have been tracking ICE raids in Champaign-Urbana, with help from those in the CU Immigration Forum, and friends who call me when they hear ICE is in town. In 2012, the Champaign County Sheriff pulled out of Secure Communities (the federal program mandating local law enforcement cooperation with ICE) after community pressure. Today, due to ongoing conversations, ICE notifies METCAD, the local 911 dispatch, when they are in Champaign County. Through public records requests, I have been able to document more than 150 visits when ICE has come to arrest immigrants at their homes, at work, or at the local courthouse. This should alarm anyone in our liberal college town, but the issue has flown under the radar. Most are unaware of the sizable immigrant population in CU, which continues to grow. According to a new report prepared by Christopher DiFranco, of the University YMCA’s New American Welcoming Center, 10% of those living in Champaign County are what the census calls “foreign-born.” Of those people, about 7,000 are undocumented immigrants. 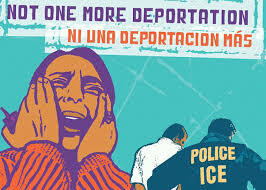 Others estimate that the undocumented population is as high as 11,000. Those without documents live in the shadows, working in the kitchens of local restaurants, doing construction, or coming for seasonal agricultural jobs. Their cheap labor provides “good living” for the rest of us in the Midwest. I have written previously about ICE’s patterns of detention here in CU. The majority of those picked up are for DUIs. ICE agents come from St. Louis to pick people up, stay sometimes for two or three days, spending nights at the Drury Inn on North Prospect. They keep people for weeks or months at the Pulaski County jail, located in far southern Illinois. In my investigation into Juan’s disappearance, I talked to several people who helped me piece together this account. I got a tip from a friend on Wednesday morning, February 14, 2018, that ICE was sighted in downtown Urbana. I talked to a worker at Pizza M, next door to Siam Terrace, who witnessed Juan’s arrest. He described the two nondescript agents, one in a Chevy sedan, the other in a minivan, both with Missouri plates. He said they looked ordinary, except that they had guns and handcuffs. The two agents arrested Juan, as well as a friend who was with him. The friend was also taken to jail and promptly released after paying a $3,000 bond. Although he has committed no crime, he now has an immigration case pending. According to data from ICE, arrests of those with no criminal record went up 146% last year. Juan is one of those who made the journey north. He travelled here following his brother, worked in local restaurants, and lived in Urbana. They worked two jobs and didn’t spend much on themselves. Juan had sent home $100,000 since coming to the states. On July 3, 2017, during one night of indulging after long hours at work, Juan had three beers, drove home, pulled up to the house where he lives, and hit a fence at the end of the driveway. A neighbor called the cops. When police showed up, Juan was inside his house. Still, he was arrested, charged with a DUI and driving without a license, and taken to jail. Juan accepted all the terms of his probation. He hired a lawyer, paid his fines, wore an electronic monitor, and did community service―he did everything required of him. On February 8, his case was officially over. ICE was waiting for him at Siam Terrace less than a week later, at approximately 9:30 a.m. The question remains: how did ICE know where Juan worked? Is the probation office supplying ICE with detailed information? Members of the Immigration Forum have met previously with head of probation Joe Gordon. They found out that the probation department was required to report to ICE by a 1995 order by 6th Circuit Judge John P. Shonkwiler, since deceased. The counties in the 6th District―Macon, Douglas, Piatt, Dewitt, Moultrie, and Champaign―are the only ones in Illinois with this standing order. The seat is now held by Judge Rick Broch. Originally published in Smile Politely, reprinted with permission.